At Instant Imprints St. Vital in Winnipeg, our customers come to us when they want to be more visible to their customers. We create that visibility five different ways: Branded Apparel (embroidery), Signs & Banners, Promotional Products, Custom T-Shirts and Print Services. When you want to bring your brand to more potential customers, there’s no better way than custom t-shirts, printing services, promotional products, custom banners or branded embroidery items from your St. Vital Instant Imprints! We take pride in providing a superior level of service, bringing you promotional items that are sure to land you in the hearts of minds of the public. Our Winnipeg Image Experts are here to help you reach your promotional goals in style. Better promotional products means more customers heading your way! Are you looking to stand apart from the competition? The exceptional level of quality that you get with Instant Imprints is sure to put you ahead of the rest. Our St. Vital Image Experts work to understand the needs of your project and help you every step of the way. Instant Imprints in Winnipeg fuses together the value and quality of a global print shop leader with a local Winnipeg touch. This means that you get your specific project needs addressed, and end up with a final product which is of much greater quality than home or office printing solutions. Across Canada and beyond, custom t-shirts are popular and effective ways to give your brand the legs to reach more prospects. A stylish custom tee design can promote your next event, show off an upcoming product or call attention to your brand as a whole. However you chose to market your custom t-shirts, it’s critical that they are well made. Instant Imprints in Winnipeg has the state-of-the-art production processes necessary to make world-class garments. In addition, our custom embroidery service can bring a whole new level of style to your professional attire or sports uniforms. Are you looking for a way to stand above the competition? Just ask your smartphone, “What’s the best custom sign and banner service near me?” You’ll be sure to find St. Vital Instant Imprints leading the pack! Our banners are durable and portable ways to bring your logo wherever it’s most effective. 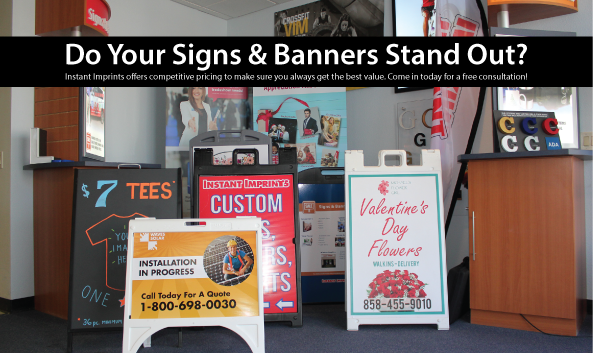 In addition, our sidewalk signs and trade show displays can help you make an impact on customers and colleagues alike. Our St. Vital Image Experts are happy to help you choose the right design options for your project, so you can stand out in a unique way! Come by our St. Vital showroom, give us a call at (204) 253-5444 or request a quote online to get started today!